Home > Shop By Brand > Dodo Juice > Dodo Juice Orange Crush Soft Wax 30 ml. Warm up reds, oranges, and yellows with natural orange oil and yellow waxes. 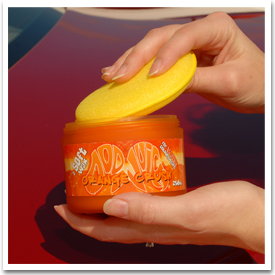 Dodo Juice Orange Crush Soft Car Wax is specially formulated for warm color finishes, like red and warm metallics. Dodo Juice Orange Crush Soft Car Wax brings out the best in warm colors with a blend of carnauba wax, orange oil, and yellow beeswax. 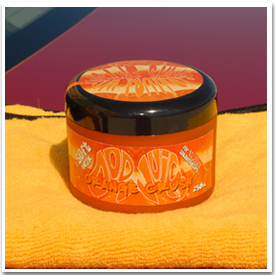 If you drive a red hot or sunset orange car, amp up the shine and color with Dodo Juice Orange Crush Soft Wax. No. 1 grade carnauba wax from Brazil- which is naturally yellow in color – is the centerpiece of this wax. Natural orange oil for wetness and yellow beeswax are added to the mix to give your vehicle’s color new life and energy. Dodo Juice Orange Crush Soft Wax not only looks beautiful, it offers excellent protection to automotive paint. Dodo’s warm car wax repels UV rays, rain, and dirt. The wax can also be used on exterior trim because it will not leave white wax stains. Use Dodo Juice Orange Crush Soft Wax on any warm colored vehicle, including reds, oranges, yellows, and warm metallics. Orange oil is one of nature's best solvents, degreasers and orange-smelling-type things. In fact, it's too good not to be in a wax of its own, so we invented Dodo Juice Orange Crush, which contains orange oil along with carnauba and beeswax, to create a soft wax for warm coloured cars. Why the name? Well, there's a great REM song about Agent Orange. And everyone loves a carcinogenic defoliant. Don't they? Please remember that Orange Crush works on all warm colours, not just orange. It also smells quite nice and orangey as you would expect. And comes in an orange jar. bare hands, to apply Dodo Juice Orange Crush Soft Wax. A very thin, even coat should be applied. Then wait 5-10 minutes before buffing. As with any car wax, we’ve found that the best results are obtained on a clean, smooth paint finish. Use Dodo Juice Lime Prime Prewax Cleanser or Lime Prime Lite Glaze to remove old layers of wax and improve the paint’s texture. Then apply a layer of Dodo Juice Orange Crush Soft Wax using a soft foam applicator or with your bare hands. Allow it to cure for 5-10 minutes. Since the cure time is relatively short, we found it easiest to work in sections. 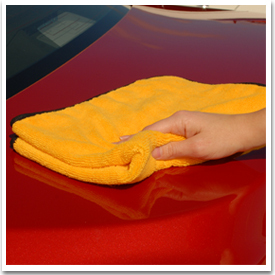 Buff off the wax with a soft Cobra Deluxe Jr. Microfiber Towel. Apply another coat after 24 hours if desired. This wax did a fantastic job on my orange Veloster Turbo. Make sure that your paint has been properly washed, clayed, polished and in my case had a layer of paint sealant prior to using this. I'm not sure if its because of my orange paint but it was very difficult to see the wax after I applied it so it took a little longer than normal to apply. I let it cure to the paint for about ten minutes and it wiped off with ease. This is the first time I've ordered/used Doodo Juice but I'm very happy with the results and I'm sure I'll try more of their products. I do have to say that they have the best and certainly most creative and interesting website that I have ever seen. I love this wax, I definitely will be buying it again. I use it on a bright red Jeep Wrangler and it looks great! I'm not sure if the color-coordinated thing really makes a difference, but I do know that this is an excellent wax either way. No doubt! Slippery, glassy-smooth finish. Even more so than Pinnacle's Signature series paste wax. May have a very slight improvement in color. Doesn't go on quite as nicely as some waxes. I feel like I need to use too-much in order to get good coverage. This may be because of the small tub size preventing me from spinning my entire foam pad on the wax surface. All-in-all, I will buy this again, and I will recommend it to a friend! AWESOME WAX!!! Easy on/ easy off. Really made my orange 2010 camaro pop!!! Left a super slick finish.